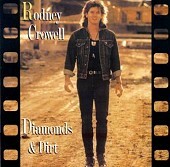 Though part of the Epic/Legacy country re-issue series "American Milestones", Rodney Crowell's Diamonds & Dirt is much more Nashville pop or bad bar rock than country. Charged by a pulsating drum beat, all of Diamonds & Dirt comes across as bad 80's pop made over to be sold to country fans. Definitely my least favorite release in the "American Milestones" series so far. I'll give it a C-.